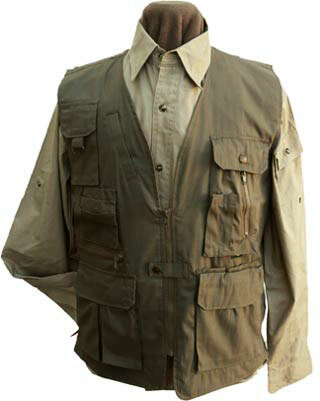 New Walkabout Safari and Photographer Vest. The Walkabout Safari and Photographers Vest is the first item a Photojournalist's bag! Buy TWO - because your guide will want yours. 18 pockets including 3 inside plus a large back pocket. Secure Filter and Lens pockets. Cool mesh lining in slit-back for ventilation. Zip front and D-Ring waist adjustments.